A man walks into a cemetery holding an electric blanket. The cord dangles behind him, hitching and bumping in the wet grass. He approaches a row of old stones, nods his head, and lays the blanket over the selected plots. Carefully, he lies down in the center and begins rolling himself up in it, tucking the fraying corners between his knees and armpits. He lifts both legs as one and folds the bottom of the roll beneath his feet, then repeats the motion with his head so he is wrapped tight and warm, like a cocoon. What emerges weeks later is fat and horrible. A white, shapeless maggot with two tiny, thin arms ending in truncated stumps. Where there was once a face, there are now three deep, black holes gaping out at the world as if desperate for any vision or taste at all. The inside of the blanket is stained a murky brown, with bits of rotted flesh clinging to the fabric that sway and flap obscenely as the bloated creature makes its way slowly out of the cemetery. Here and there, it bumps into the headstones, knocking a few over. It uproots flowers from their vases. It leaves a slug-trail of slime in its wake, coating the already wet grass with the rainbow sheen of spilt motor oil. Baby Ruth Pontico died in December 1941. She weighed 815 pounds and was married to a man who weighed only 130 pounds. The weight of her husband is not important. Baby’s mother was a fat lady for Ringling Circus, herself weighing in at 600 pounds. On a visit to her sister’s home, Baby Ruth fell through the floor and had to be lifted out with a crane. She died on an operating table while undergoing an operation to remove a fatty tumor in her thigh. She began vomiting and, due to her weight, could not roll over and strangled to death. Days later, the creature lumbers through the double glass doors of a Wendy’s. The patrons barely look up from their burgers and fries, lost in the microscopic swelling of their bodies. The creature makes its way up to the register, pointing one of its thin arm stumps towards the picture menu behind the cashier’s head. “I’ll have a number two, please,” It says in a squeaky voice like air being forced from the pinched end of a balloon knot. The cashier presses a few buttons on the register and hands the creature a small plastic tray. The creature leans over the counter and vomits a handful of quarters from the holes in its face. The cashier scoops them across the counter into the register, his fingers sticky where they make contact with the coins. “That’ll be ready in a few minutes,” The cashier says. He wipes his fingers on his red work-shirt, leaving a series of greasy streaks across his chest. “Thank you,” the creature says. Slowly, it moves to the far end of the counter, sliding the tray along as it moves. It waits. The tune of life is swallowing and belches. Cars pull up to the drive thru and order bowls of chili, large sodas, chicken sandwiches, and so on. Their voices can be heard, warped and distorted, throughout the restaurant as the creature waits. When the food arrives, the creature thanks the cashier and makes its way over to a dirty table by the window. In a single, clumsy motion it slams its face into the food without bothering to unwrap it first. There is the sound of a vacuum running, with the clacking of pennies audible just beneath. The food is gone in a matter of seconds, and the creature looks around at the other patrons, eyeballing their food with hunger scratched across its black eyeholes. Letting out a long, ear-piercing shriek, the creature forcibly vomits thousands of quarters. They launch from the holes in its face like bullets, slashing through obese women as they eat dripping burgers, digging into the soft organs of small children playing with cheap plastic toys, and lodging themselves into walls and shattering windows. The cashier falls to the floor with seventy-five cents digging trenches into his brain. As the last body falls, the creature makes its way slowly from table to table, eating the leftovers. The pores of its body enlarge and begin soaking up the blood pooling on the tabletops. Its body bloats and swells, filling the restaurant with its girth as it eats the false-Formica tables, the hard vinyl seats, and finally even the corpses themselves before drinking the fat in the deep fryer and leaving the gutted Wendy’s to collapse from the hollowed emptiness it leaves behind. The creature makes its way over the plots, bumping into a few headstones and knocking them over as it lumbers slowly towards the familiar row of stones. The blanket lies like a waiting partner on the grass. A few insects have picked away at the mildewed fabric, but it is more or less wholly intact, missing only some non-noticeable fragments of stain. With a practiced ease, the creature rolls itself up in the blanket, lifting its stumpy backside into the air and tucking the rolled up blanket-bottom beneath it, then repeating the motion with its quail-egg head. There is a deep sigh, and the sound of air escaping balloon knot, and then the earth itself gives way, and the creature falls—cocoon and all—into the rotted graves beneath, crushing the dusty skeletons in their tattered burial shrouds. It writhes for a few quiet moments, quarters dripping from its eyes like tears, filling the blanket with a grave robber’s wildest dreams. The powdered bodies underneath the thing still wondering what it might next become. Dustin Reade lives in a trailer behind a BBQ restaurant in Port Angeles, Washington. 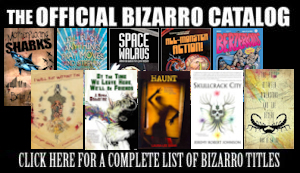 His book Grambo was published as part of the 2013-14 New Bizarro Author Series. 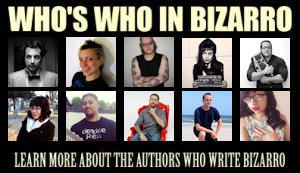 He is also the head editor of the online bizarro fiction magazine, The Mustache Factor. He once won one of those “Eat-A-Giant-Steak-And-Win-A-T-Shirt” things in Hollywood, California. This entry was posted on March 14, 2014 by G. Arthur Brown. 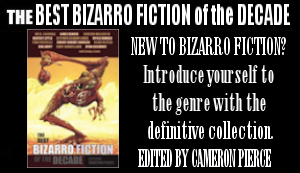 It was filed under Flash Fiction Friday and was tagged with dustin reade, New Bizarro Author Series. moved to France, residing within the Paris suburb of Argenteuil. “pied-noir” in This particular language slang) accent for his movie Le Coup een Sirocco. Benguigui (as he was still called) responded and gained the business. Presgurvic, later to get his most important songwriter.